Does your cat like to climb trees? Have you ever wondered why? 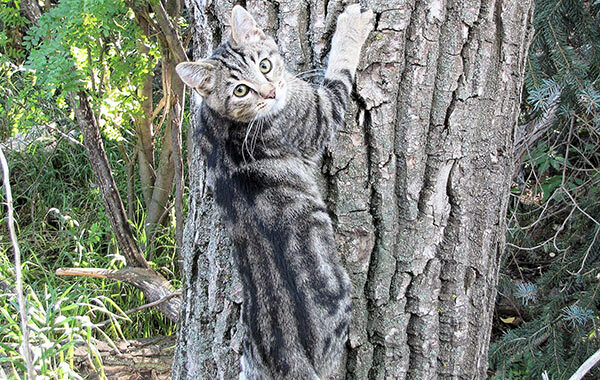 Find out why cats climb trees. Cats are hunters, but they are also hunted by larger animals like stray dogs, coyotes, and bigger cat species. Trees and high places offer safety. Most domestic cats prefer to hang out or sleep in high places — they feel safer and more relaxed there. If a cat on the ground sees an unfamiliar dog approaching, he will often jump up on the nearest wall until it has passed, just in case. Trees and walls offer a good place to scan the neighbourhood — either to see if there are any enemies nearby or to watch for prey. While cats will also sometimes climb trees to try to catch birds, they are more likely to stalk and pounce on birds that are on the ground. Cats also run up trees for fun and to get our attention. Cats are good climbers because their extendable claws allow them to grip a tree trunk, while their rear legs push themselves upwards. They hold their bodies, with their centre of weight close to the tree, in order not to fall backwards. Though leopards can climb down a tree head first, our domestic cats have to learn to come down backwards. Climbing is in the feline ancestry. Twenty-five million years ago, their long-ago ancestor, Proailurus lemanensis, from which all the cat family descend, climbed trees. Some of today’s biggest cats (lions and tigers) rarely climb trees as adults, perhaps because their weight would be too much for many branches. At the other weight extreme, the margay — a small wildcat from South America — spends almost all its time in trees.